Some months ago I had the good fortune of working with German Lyon, the winemaker of Vina Perez Cruz on a tasting that he held in New York City at Puro Chile. Lyon was very personable and relaxing to be around. At the tasting we tried a number of his wines, including his Cabernet Sauvignon Reserva from 2010, a Limited Edition Carmenere 2010, a Malbec from 2010, a Syrah from 2010 and a Petit Verdot from 2009 called CHASKI. We also tasted two blends that he makes: LIGUAI 2009 and QUELEN 2008. I was quite taken with a number of the wines but it was the CHASKI that was the most interesting to me of the mono-varietals although the Cabernet was a close second. When I asked why he had decided to plant Petit Verdot, he said it was something he had always wanted to try but that it was difficult because he had no references somewhat like driving a car with blinders on. I found the wine to be harmonious and long lasting. The QUELEN was also a favorite, again it was the blend that got me, 42% Petit Verdot, 33% Carmenere and 25% Cot. The grapes all grow in the Maipo Andes Valley. Chile’s wine trade was born in that region in the mid-19th century. The vineyards tend to be well protected thanks to the Andes mountains on the east and the coastal mountain range on the western side. Additionally, the Perez Cruz vineyards have alluvial soils with good drainage – a great combination for grape growing. Thanks to the protection of the mountains, these vineyards also have good diurnal variation or temperature changes between the day and night, also essential for producing good grapes and elegant wines. All of Lyon’s wines had an interesting minerality to them which I very much appreciate. Minerality and sapidity are such hard terms to define but suffice it to say the former is akin to acidity with a touch of a racy note and the latter is somewhat salty or saline in taste. That might sound odd in a wine but I have found some of the most food-friendly wines have these two characteristics which can cut through fatty, or juicy flavors and leave your palate clean and ready for your next morsel. Chile’s enormous coastline is one of the reasons for this particular phenomena as is the sandy and chalky soil underlying many of the vineyards. Lyon’s wines all had an herbal note as well. He attributed this to the green harvesting that he had done in the vineyards. His fruit was also ripe but not overly so. In fact, I found all of the wines to be very balanced. I have none of them at home with me and would love to open a Cabernet with the steak I made. Alas it will have to wait until another day. 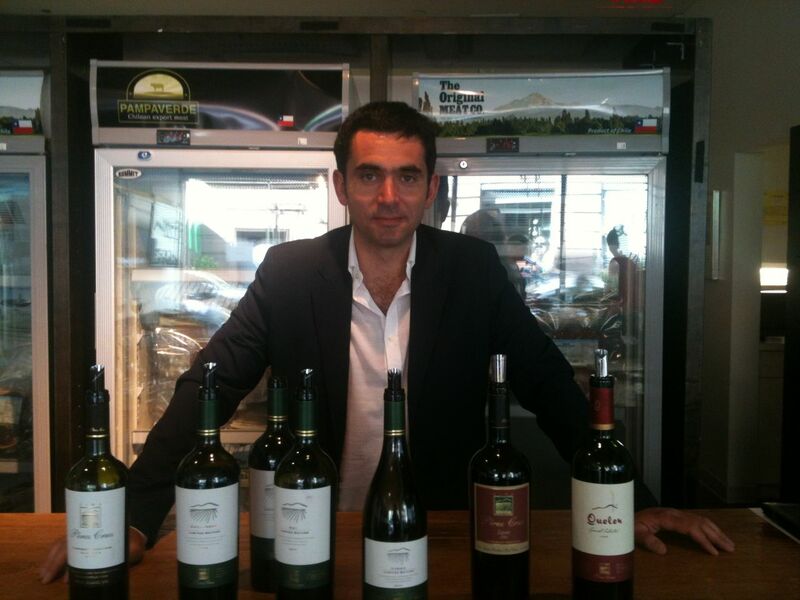 The wines are available at Puro Wine and through their distributor, Cana Selections.